1) Bacteria-as-venom model. The salivary bacteria are beneficial to the lizards, since they act as a de facto venom. 2) Passive acquisition model. Salivary bacteria are acquired from prey and the environment, and play no role in capturing prey. One piece of evidence for this hypothesis is that captive lizards in hygienic conditions lack salivary bacteria–very clean drool. Original caption (mine is better! ): Pursuit of an escaped prey by a second dragon. 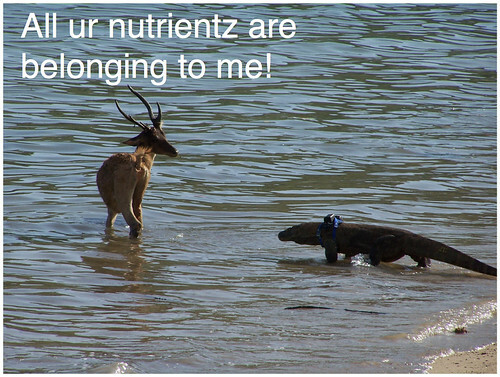 An injured Timor deer that has escaped an initial lizard has fled to the ocean and is being stalked by a different dragon. This second lizard succeeded in killing the deer. The Komodo dragon pictured is wearing a GPS collar used for tracking the animal. Occasional prey escape is essential to the operation of the lizard-lizard epidemic model. 2) Lizard bacteria cause an infection in tissues that are eaten by lizards. 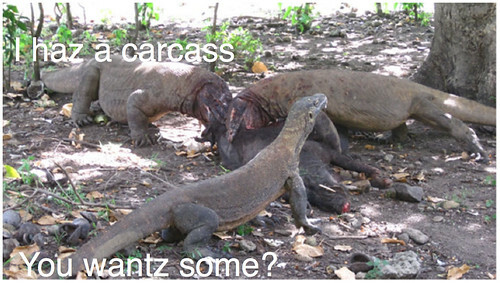 3) Infected prey are EATED by other Komodo Dragons. Original caption (mine is better! ): Communal feeding illustrated. Three dragons are feeding on a wild pig. The large prey size of Komodo dragons with overlapping lizard home range generally precludes a single lizard from consuming its large prey alone. Multiple or shared feeding facilitates spread of infectious bacteria between lizard mouths. 4) Bacteria acquired from devoured prey colonize and reproduce in the lizard mouth. Like I said, there’s more work that needs to be done, such as characterizing the oral microbes, but it’s interesting, if drooly, stuff. This entry was posted in Microbiology, There Be Dragons!. Bookmark the permalink. First of all – if we’re all so fascinated by Komodos’ drooling, shouldn’t we maybe catch us a dragon, obtain 50cc of drool/venom samples, sprinkle them on a bunch of stakes and go on an antelope stabbing spree? I guess that would solve the “is the saliva really THAT deadly” dilemma? Surely we’re not above killing/maiming a bunch of game animals for the greater good? Also, while we’re @ venom – aren’t Komodo bites supposed to be actually venomous now, rather than just septic? As in: venom dripping from venom sacs directly into bites. I remember reading something about a bunch of anti-coagulants and other wackadoodoos supposedly being produced by Komodos. Gee, the more I think about it, the more I go back to my first question – we can catch dragons easily, we do experiments on animals all the time, why are Komodos maintaining all this mystique? At least at first sight it appears that a year or two of serious work (feed, catch, collect, stab) should easily clear at least the basic uncertainties we have about this species. On a lighter note: lolcats are a form of art ;). You may turn them into lolruses or loldragons or whatever, but you gotta stick to the form, man! All ur nutrientz are BELONG to me! Keep it real, as they say ;). In the paper they tested samples from various Komodos on mice to demonstrate lethality.